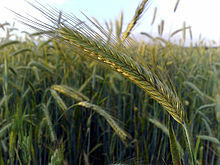 Rye (Secale cereale) is a gress widely growen as a grain an as a forage crap. It is sib tae baurley an wheat. Wikimedia Commons haes media relatit tae Secale cereale. This page wis last eeditit on 16 August 2013, at 18:29.